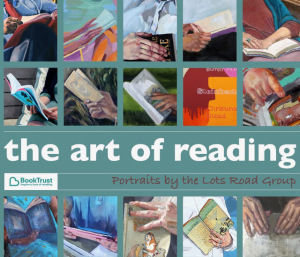 The Lots Road Group, in association with BookTrust - Britain's largest reading charity - is celebrating Children's Book Week with a portrait exhibition The Art of Reading at Waterstones' first dedicated gallery space in its flagship academic bookstore in Bloomsbury. ​The exhibition - a celebration of the pleasure of reading – runs from 3-30 November in an area associated with the influential Bloomsbury Group of English writers, intellectuals, philosophers and artists. The portraits are of people spanning different categories of the written word. They include children’s authors such as Michael Bond, creator of Paddington Bear, and Julian Warrender, teen authors Natasha Farrant and Philip Womack, and novelist and poet Julia Bell. It also portrays academics in the field of literature, such as literary critic Professor Dame Gillian Beer as well as literary agent of the Year 2014 Caroline Dawnay, as well as relatives and friends of the artists. There’s even a portrait of an unknown sitter on instagram! In addition, Michael Bond, portrayed with the artist Hero Johnson’s childhood copy of his book ‘The tales of Olga da Polga’, revealed that he still has the eponymous guinea pig’s successors! And, referencing A A Milne’s most famous creation, ‘Winnie-the-Pooh’, Artist Sarah Reynolds posed her granddaughter lying down under a tree with one leg in the air, just like a famous illustration of Christopher Robin by E.H. Shepard, who, like the Lots Road Group, studied at The Heatherley School of Fine Art in Lots Road, Chelsea. Hilary Puxley, leading this year’s exhibition for the Lots Road Group, said, “This is the third Lots Road Group annual exhibition and this year we’ve taken the idea of the sitter reading - a perennial theme throughout the history of portraiture – as our subject . Our exhibition brings the theme up-to-date, giving an insight into the ways in which people of all ages derive pleasure from reading now. Alla Broeksmit is one of the groups' members displaying her sitter entitled, Dade Hayes. "My sitter is my brother-in-law, Dade Hayes," says A.Broeksmit. "He is the author of two narrative non-fiction books about entertainment, 'Open Wide' and 'Anytime Playdate,' and is working on a critical history of the television network HBO. Dade is the editor of Broadcasting & Cable, a television business magazine. His writing has appeared in the New York Times, Los Angeles Times, and Entertainment Weekly." Heatherley’s is one of the oldest independent art colleges in London and one of the few in Britain that focuses purely on portraiture, figurative painting and sculpture. The 15 portraits, executed in oils, featured in the exhibition, show the acute powers of observation and attention to detail the institution, now in its 176th year, instilled into the Lots Road Group. Alla Broeksmit, born in Ukraine, lives and works between London and New York. A. Broeksmit’s colorful paintings are concerned with portraying the figure in bold and rich colors. A continuous interest in personal memories, auto-fiction and invented mythologies run through her paintings. Her subjects, often times family members, friends or even herself, somehow take on a complex individuality and emotional presence. They explore and extend the understanding of portraying the figure by playing between the observed subject and the artist’s imagination, the insight given by her sitters and the paint itself. A. Broeksmit is currently in the Master Program (MFA) in painting at the New York Studio School, studying in the atelier of artist and Dean of the school; Graham Nickson, and also in the atelier of Judy Glantzman and Kyle Staver. She studied classical painting techniques and received a diploma of portraiture at Heatherley’s School of Fine Art in London. A. Broeksmit sought training in other parts of the world including Italy, France, India, and Belgium. Visit www.allabroeksmit.com for more information. NOTES TO EDITORS The Art of Reading is in association with BookTrust at Waterstones Gower Street. 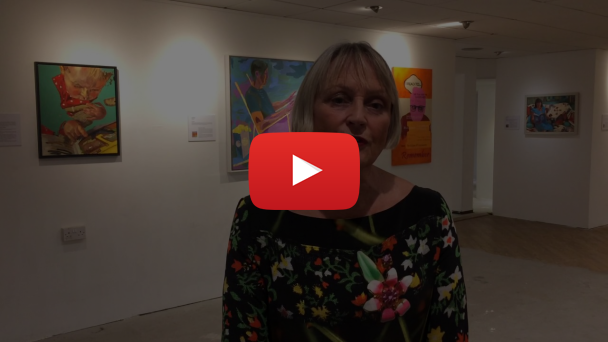 The Heatherley School of Fine Art is sponsor. Biographies of artists and sitters – who live in and around London, Cambridge and the south Downsarea - are available as are photos of the artworks.